Judging by most mass-produced products on the market today, you’d think humans come in just three sizes. We don’t. So why don’t the products we buy reflect that? Custom products perform better and consumers embrace them, but custom manufacturing is often not economical. Collecting personalized data from consumers is tricky, custom tooling is expensive, and tracking customized parts from initial order through production and shipping is complex. 3D printing is changing everything. Falling costs and innovation in materials have made 3D printing practical for manufacturing—and promise to bring the dream of mass customization into reality. At CES 2018, Formlabs demonstrated this reality. Our booth showcased an entire production process for custom earbuds—from in-ear scan to final product—that can be easily deployed in mass markets. Tailor-made items perform better, plain and simple. 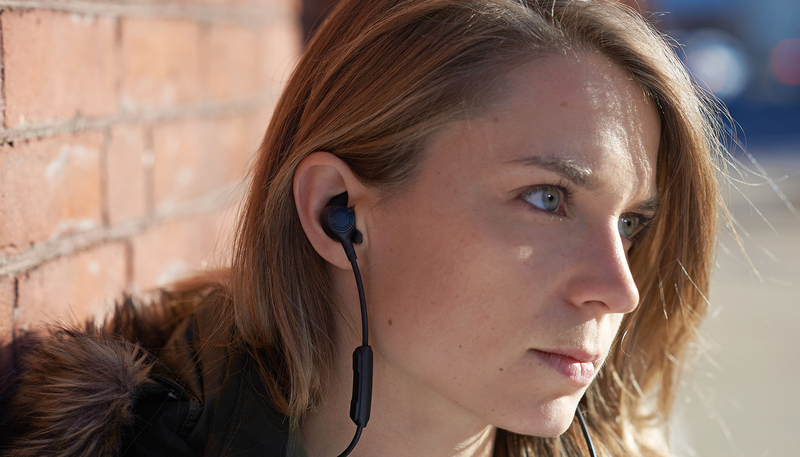 A truly custom-fit earbud can provide unparalleled long-term wear, comfort, stability, and noise reduction. Advancements in scanning technology paired with accessible, high quality 3D printers make it viable to manufacture custom earbuds and other audiology products at scale. Manufacturing with 3D printing makes producing on-demand custom earbuds a reality. 3D printing is a zero tooling production process&ndash;there’s no need to produce thousands of the same item to recoup the initial cost of molds. Complexity and variety are “free”; a 3D printer takes no more time, energy, or material to manufacture a complex shape than a simple one, and zero tooling means printing a variety of designs requires no extra production costs. With desktop 3D printers, it’s easier to scale up as production needs rise. 3D printing is a zero tooling process; it requires no costly up-front investment in molds. Ease of customization is an inherent advantage: manufacturing a variety of complex designs requires no more time, energy, or material than producing a set of standard simple parts. The production process for custom earbuds demonstrates an important consideration when thinking about integrating 3D printing into production or pursuing mass customization. The final, useable products don't have to be 3D printable; you can use 3D printing to create molds (which is the process for earbuds), vacuum forms, or casts, and still make the final products out of proven, cost-effective materials. Together, 3Shape’s Phoenix in-ear scanner and Formlabs’ Form 2 3D printer provide an accessible, intuitive workflow that can be deployed at scales from one-off production to mass manufacturing. The end-to-end process requires minimal labor, has a low footprint, and most importantly, delivers a high-quality final product. 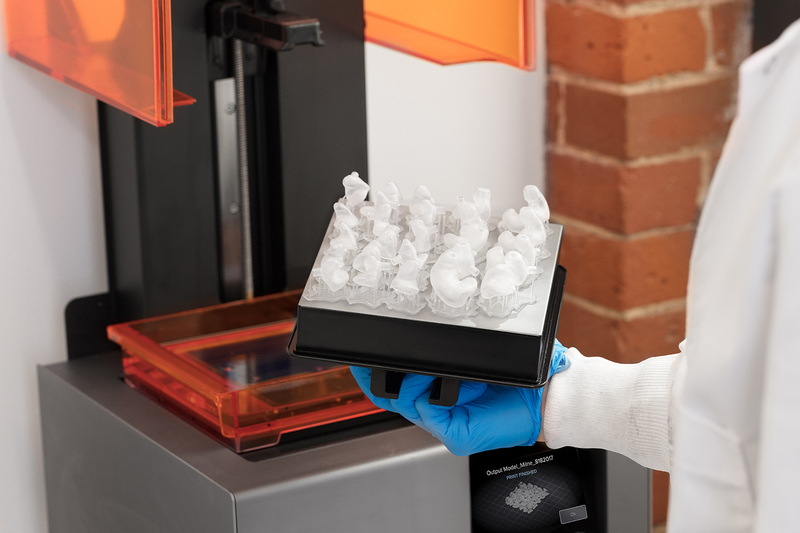 Paired with digital scanning solutions, the ear mold 3D printing production workflow is optimized to quickly and affordably produce high volumes of consistently high-accuracy products. The process begins with a fast, non-intrusive digital scan of the customer’s ear canal using a 3D scanner. A technician edits the digital file into a 3D printable mold, and sends it wirelessly to the 3D printer. Once printed, the parts are rinsed in isopropyl alcohol and post-cured. A technician casts biocompatible silicone into the molds, removes the 3D printed shell, then finishes and coats the final product. Walk through a step-by-step guide of the production for custom silicone ear molds using the Form 2 and Formlabs’ Clear Resin. Custom earbuds are made by casting a biocompatible silicone in hollow molds printed in Formlabs Clear Resin. Each printed mold costs $0.40 to $0.60 in resin, and the overall production of a final pair of earbuds costs approximately $3 to $4 in raw materials (including silicone and lacquer). What’s Next for Mass Customization? Custom earbuds are just the beginning. Advances in 3D printing and scanning technologies have opened a market that was previously only accessible to audiophiles or performing artists, and we predict that many more industries will be able to offer their customers the performance, comfort, and convenience of customized products. Learn more about the future of manufacturing and mass customization from experts who spoke at our Digital Factory conference, including New Balance, which last year announced a partnership with Formlabs to bring 3D printing to large-scale, Massachusetts-based footwear production. Watch Edith Harmon, New Balance vice president of manufacturing innovation, speak at the Digital Factory conference about how the company plans leverage 3D printing to bring custom high-performance footwear to the consumer market. Interested in More Audiology Applications? Learn more about Formlabs' current audiology offerings and partnership with 3Shape, and stay tuned for more to come in 2018. At CES 2018, Formlabs and 3Shape partnered to demonstrate an end-to-end solution for manufacturing custom earbuds.